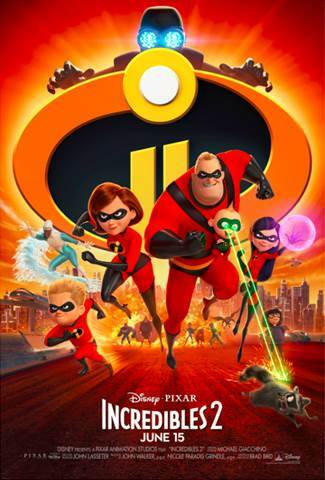 Running on Pixie Dust: Incredibles 2 - A Parr-fect Family Movie! Incredibles 2 - A Parr-fect Family Movie! We just returned from a family vacation to Smith Mountain Lake in Virginia and took advantage of a rainy day to see Incredibles 2 during opening week. This was Caleb's first visit to the movies and he couldn't have been more excited. Unfortunately, the little theater didn't have a poster of the movie to get his picture with so we'll have to settle for this goober making whatever face he's making in his movie seat! Now, onto the movie. One word to describe it - INCREDIBLE! Sorry, that was cheesy, but it's totally true in this case. First of all, shout out to Mrs. Incredible, or should I call her Elastigirl, as she steps out into the limelight. Once again, the supers find themselves struggling with society's expectations of them. Mr. Incredible, Mrs. Incredible, and Frozone are once again joined by the next generation of supers in their adventures. And not to be upstaged, we all learn about Jack Jack's powers while Mr. Incredible is starring in the role of stay-at-home dad. But no need to fear, when Jack Jack's powers become even a bit much for Mr. Incrdible, Auntie Edna Mode is there to help out! Without giving too much away, when the world once again needs saving, it will take a family effort to try and save the day! Incredibles 2 has kept us waiting 14 years, but it was well worth the wait! The kids loved it and laughed out loud at many of the scenes. Don't forget, if you're traveling to Walt Disney World this summer to check out the Incredible fun including dance parties and character meets! Even if you can't make it the fun in person, check out the free printable activities and coloring sheets below to continue the fun with your family.